If you are a DIY lover, the chances are that no matter what goes wrong in your home, you like to deal with it yourself. While, in most instances, that’s all well and good, when it comes to dealing with plumbing issues, you need to be careful. There are plenty of plumbing problems that you can handle yourself, but there are some that you should leave to the experts. You might think that you can handle every problem, but there are some issues that if you don’t fix properly, can cause some serious problems. That’s why, when it comes to DIY plumbing, it’s crucial that you know your limits. At some point or another, we’ve all had a leaking tap. You probably think that it’s harmless – surely a dripping tap can’t do that much damage? Or can it? If you leave your tap to continue dripping, it will waste gallons of water. According to a recent study, a tap that drips all day long, wastes over 3000 gallons of water per year. That’s enough water to fill a small swimming pool or large hot tub – that’s a lot of water to waste. As well as wasting water, your leak could suggest that there is a more serious issue with your plumbing. 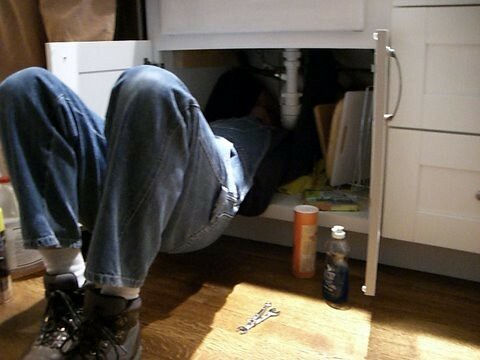 Attempt to fix the leak yourself, but if that doesn’t work, make sure to call in the professionals. Not only is a lack of water pressure annoying – no one likes to shower with little water, but it could also indicate a serious issue. If you notice that the problem only affects one or two things, like your shower and sink, it could be caused by a buildup of dirt. This is easy to deal with and won’t require the help of a plumber. However, if the problem affects every tap in your house, there is a more severe problem. It could be something to do with the water supply or something else entirely, only a qualified plumber will know what the problem is. If your home’s pipes have ever frozen, you will know how much of a nightmare it can be. Frozen pipes are prone to bursting and cracking, and if not dealt with quickly, can end up flooding your entire house. Don’t make the mistake of trying to deal with this yourself, as it will only end in disaster. Ignore the DIY de-icing instructions you’ve found online and give a plumber a call. In these types of situations, it’s always better to be safe than sorry. If you’ve just noticed that your bathtub is refusing to drain, you might be wondering what the problem is. If you suspect that it has a clog in the pipes, you need to get this dealt with as soon as possible. As otherwise, the situation will only get worse. As soon as you start to notice that your bath is no longer draining as quickly as before, get in touch with a plumber. The sooner you get this dealt with, the easier and less expensive it will be to fix. You might like to do the work around your home yourself, but sometimes, calling in a professional is necessary.